I became a certified Restorative Exercise Specialist™ in 2013. (To learn more about restorative exercise check out http://www.nutritiousmovement.com.) 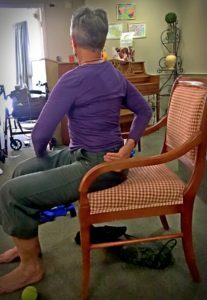 I was so excited and enthusiastic about sharing what I had learned and was experiencing personally, I volunteered to teach restorative exercise at the independent living apartments where my husband and I were then living to accommodate his multiple health challenges before his passing. 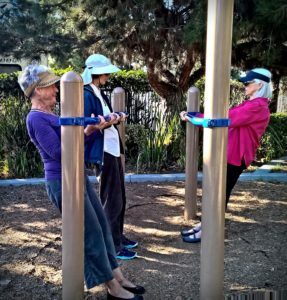 My class consisted mostly of people in their 80s and 90s – many of whom were using walkers. I learned about modifications, about listening, about watching, about adapting to the needs of my students. (That’s me learning to teach from a chair.) And about commitment – both mine and theirs. 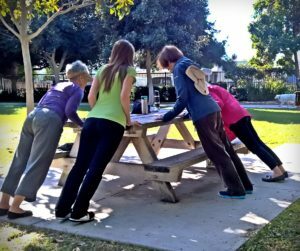 These photos show one of my classes doing foot exercises while seated. Some days they are able to do some standing exercises. It’s all about movement – large or small. 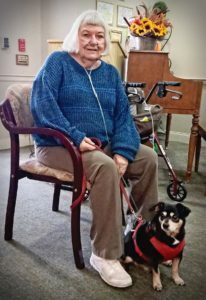 This is JoAnn, age 80, with her dog Jeffry Edgar Littleton. Why three names? “I have three names,” she says, “why shouldn’t he?” In the few months she has been attending class, the pain in her feet has completely disappeared thanks to her daily practicing and taking walks with Jeffry four times a day. One 90-year old gentlemen started two years ago with neuropathy and pain in his feet. He is now able to move his toes and feet free of pain and continue walking. Another lady, also in her 90s has been working on her balance and strength. She can now get up and down from a chair with minimal use of her hands. 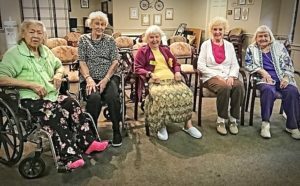 Joining Katy’s restorative exercise classes literally turned my life around. 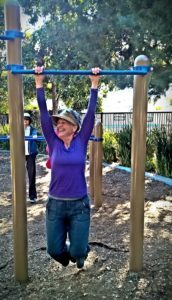 From the very first class, I began noticing changes in my body. And I began to learn the CAUSES for what was happening to me. This wasn’t “old age.” This was old habit patterns coming back to bite me. 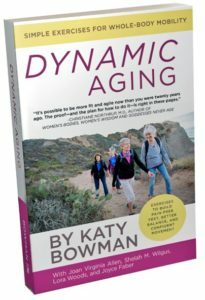 There is no disease called “old age.” There is just the accumulation of years spent treating/holding/moving/not moving my body in certain ways that produce results. If I walk out of alignment – even something as simple as my feet not being “straight” – over the years there will be ramifications in my feet, ankles, knees, hips, back, shoulders, neck and head. Today at 80 as a result of my restorative exercise practice, I have seen significant improvement in my whole-body movement so that I no longer have pain and numbness in my neck and arms, I am able to walk in my Vibram five-finger shoes and hike in the mountains, my balance is excellent and I welcome the opportunity and ability to climb the stairs in my new two-story home. This is a fun experience for me. Some weeks we meet in my home to work on the correctives; some weeks at a local park to learn how to walk in form, hang from bars and climb trees; and, some days at the beach to practice walking in the sand. 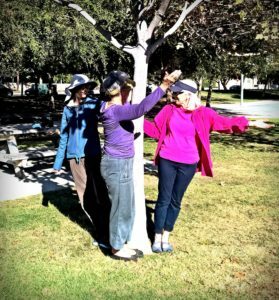 On this day in early November, Birgit, Julia and Shelley have joined me at the park. Here is how we learn, play and MOVE! For me, I feel privileged to have touched the lives of all my students over the years in some small way to get them moving. What a beautiful site. I hope to come back often! Great work you are doing ! I see so much joy in those photos ! Joyce, you are such an inspiration! Loved the shared experiences in this piece. Very inspirational Joyce, thanks for the great information.